Home car seat	Traveler beware: Car seat laws in Costa Rica are stricter than those in the U.S.
Traveler beware: Car seat laws in Costa Rica are stricter than those in the U.S. Many travelers are surprised to learn that Costa Rica, though still categorized as a developing nation and famed for its rugged and largely unpaved roads, has car seat laws. 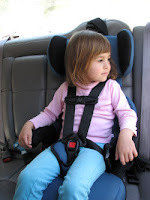 What may surprise traveling parents even more, however, is to learn that those car seat and safety booster laws are actually stricter than current child passenger safety laws in California—or elsewhere in the United States. Specifically, where California state law currently requires all children up to 6 years and 60 lbs. (27 kg.) to ride in a car seat or safety booster seat appropriate for their size and age, Costa Rica now requires children to ride in an appropriate car seat until they outgrow it (typically 110 cm or 43 inches) and then to use a safety booster until they are 12 years old and 145 cm (57 inches). While every state in the U.S. requires children to ride in appropriate car seats or boosters to 4 years, the laws concerning the upper height, weight and/or age requirement for booster seat use still vary widely by state. For example, in New York booster seats must be used until a child is 8 years and 80 lbs, but in Florida children 4 to 5 years may be either in a federally approved child safety restraint… or a safety belt. At this time not one of our states requires boosters to be used until age 12. If you are traveling to Costa Rica from the U.K., however, this law should sound very familiar. Fortunately, most major airlines still grant passengers free checked or gate-checked car seats and boosters (call your airline if you’re not sure). But if you have already discarded your booster once used by your 11-year-old and have no immediate plans of travel to the U.K. or anywhere else he might still need one, or you want to travel as light as possible to Costa Rica, you can opt to rent a car seat or booster along with your rental car, with rates ranging from $5 per day per car seat or booster from Thrifty SJO to Avis’s unknown rate TBD at time of rental (no thanks!). As for me, traveling to Costa Rica with three children in this age bracket and a total of six passengers, I was happy to discover Vamos 4×4 (www.vamos4x4.com), a car rental agency that not only quoted less for the 7-seater SUV we require than other agencies I tried (even with a corporate discount), but that also includes one child safety seat or booster free with your rental—along with some other complimentary items I know will come in handy. Plus, we adults can take turns driving for no extra fee. For my bigger kids, I was planning to bring along their RideSafer travel vests, which for those who are unfamiliar replace booster seats and fit nicely in the side pocket of the suitcase—though on second thought I don’t expect Costa Rican traffic police are very familiar with these. They are, however, probably quite familiar with the enormous, easily identifiable 7-seater SUVs mostly rented by tourists with, ahem, children. Rather than risk a spirited debate on the subject in a language I never formally studied – and a potential car seat fine x 2, I may make other arrangements, including bringing along our GoHybrid travel car seat/booster (shown above), which has the advantage of working for any of our 3 children at this time and folds into its own travel bag (in which I can always manage to fit a few extra things) for a free ride with our airlines. Fresh Costa Rica tips for travel with young children! 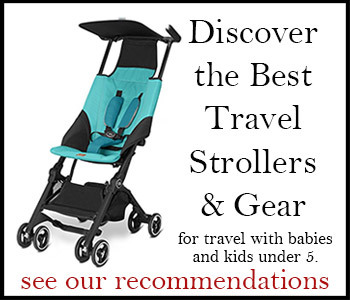 If you are planning travel to Costa Rica with young children – especially to the Santa Teresa area with babies, toddlers, or preschoolers – don’t miss our “5 Best with Children Under 5: Costa Rica” and other tips and suggestions at www.TravelswithBaby.com. Do you have a helpful Costa Rica travel tip or suggestion for families? Comment below or contact me about sharing your recommendations. P.S. I should mention that I found Vamos 4×4 on my own and they did not sponsor this post, nor are they giving me a free set of wheels in Costa Rica. My understanding is that the law requires the child to be both the correct age and height before they can travel without a booster seat; not one or the other. I have never seen a car in CR with a tether but very recent models may have them. The only way to be sure is to contact your rental firm directly. Very useful information for parents traveling to Costa Rica, especially as these legal requirements are fairly recent. Thanks for posting. Thanks for the heads up, Sara. I will see if I can get confirmation – 12 seems a bit much for most kids around here. My daughter is not overly tall (below average height for her age), and in one of our back seats she is simply too tall for the shoulder belt if she rides in a booster. I would hope height would be the most important factor since the main purpose of the booster is to keep the shoulder belt off the child’s neck, but I’m not so sure it always is. We're heading to CR next year with 3 kids – a 9, 6.5 and 3.5. I have a Safe Rider Travel vest and a Go Hybrid and I can bring a backless booster for the 9 year old, BUT do cars/vans in CR have TETHER since the GO won't work without it? Is the CR law for boosters 12 yrs of age or 45 inches or must they meet both requirements before using solely a belt? Our 9 and 11 year old boys are both 45+ inches. Thx!